We are accustomed to growing plants on the soil in the ground. But did you ever imagine creating a garden vertically? The trend of vertical gardening has set in for the past few years in Canada. Many buildings and even houses have started to incorporate these vertical gardens which come with many benefits. You may have seen the beautiful vertical garden at Edmonton International Airport welcoming visitors with its colorful cloud patterns. The Semiahmoo Public Library also has an aesthetically pleasing living wall of plants around its buildings. You can find an amazing mix of yellow, pink and red made up of different plants such as wintercreepers and hydrangeas. In fact, many other countries like Mexico and India are already looking at vertical gardens to help solve the space problem. How does vertical gardens help improve the city greenery and aid food security? You are sure to get lost in the greenery of vertical gardening. So before that, let us give you a hint of some of its benefits. Vertical gardens are great space savers. You don’t need to dedicate any area of your property to the garden and can have it vertically. You have seen the examples of professional vertical gardens on the various building like Edmonton Airport but it can also be done easily at your home. You can just hang plants in pots vertically on your wall without compromising your real estate space. 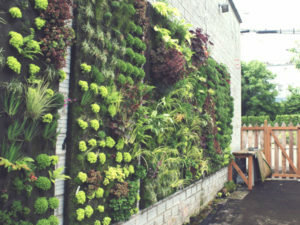 One of the main benefits of vertical gardens is that it can be used to clean the polluted air. You can have it indoors but the best use has been seen in some countries where streets are integrated with vertical gardens to keep the air pollution free. 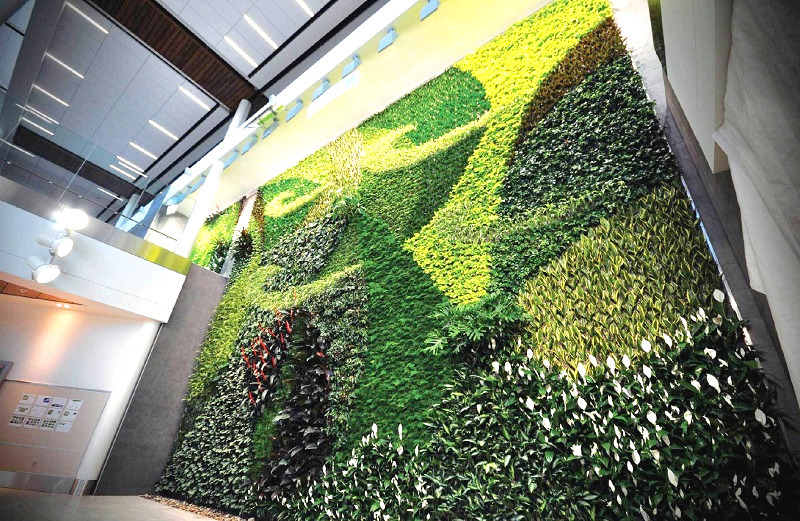 The vertical garden at Edmonton International Airport was created after researching plants that absorb air pollution effectively. The plants were recommended by NASA and included 9 species of air cleaning plants. Vertical garden is cost savers in many aspects. You don’t need to have any separate space which implies you are not paying for the land. It’s also less costly to maintain vertical gardens as the professional ones don’t use soil. They can be watered automatically using pumps and pipes mixed with nutrients. The residue nutrient is drained off for reuse once again. A similar system is used by the Cloverdale food bank which grows fresh green vegetables on vertical walls. They don’t contain any soil and take up minimum space. The vertical garden was installed by an organization called Living Garden Foods which specializes in the niche. They plan to promote vertical garden in communities that struggle with food security. The installation uses a hydroponic technique to deliver a proprietary nutrient solution to the plants. The technique uses less water and also saves the cost of weeding. Authorities at the food bank were able to deliver fresh green with the help of this system of gardening. Are you looking to install one for your business too? Previous Post: Why is Ecological Restoration Beneficial for your Garden?